Zeus, the king of gods. Was the son of Kronos, king of Titans, he was afraid that his kids would kill him like he had killed his father. Kronos started to eat his own children so they one day won’t kill him. After Zeus was born his wife swapped the baby Zeus for a stone, then hid him in a mountain with a goat that brought him up. 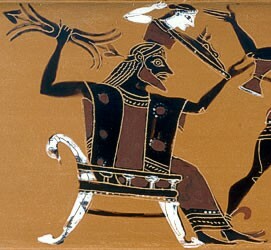 When Zeus was older he became Kronos’s cup bearer, he then fed his father a potion that made him throw up all of his sons and daughters, then Zeus and his 5 other siblings had a war against Kronos and his Titans, and Zues defeated Kronos and his Titans.